Paris exudes artistic inspiration. It is the sort of place that makes you want to pause, reflect and create. It’s probably why I find myself spending an inordinate amount of time with my journal every time I’m there. 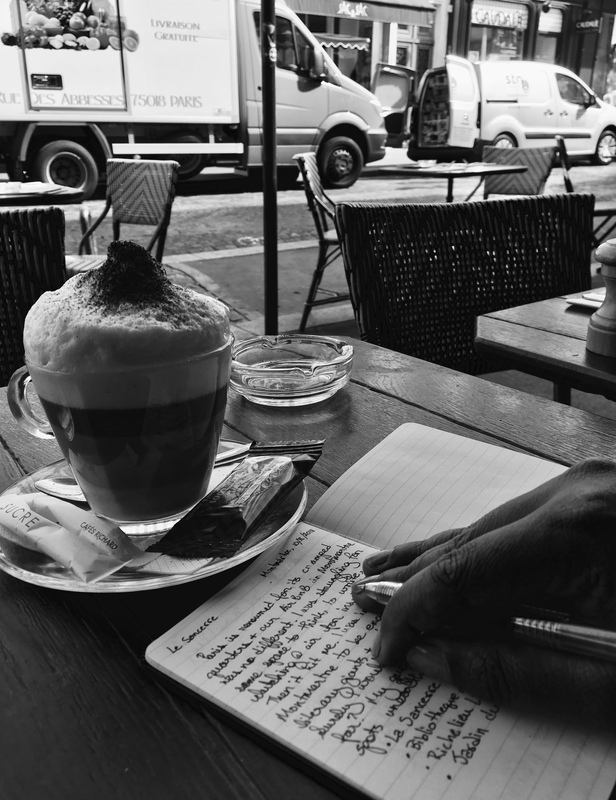 Here are 6 of my favourite spots to write in Paris. Paris, renowned for its ornate architecture and elegant landmarks, is also notorious for its cramped quarters. Our AirBnB in Montmartre, a brilliant depiction of Pinterest shabby-chic, was no different. My husband, toddler and I were sandwiched inside a tiny, ground floor studio, tastefully crammed with books, maps and all manner of antiques. But I was struggling: struggling for some space to think, to write, my mind scurrying over the dimly lit walls for inspiration. I found none. And then it hit me. I was in Paris. In Montmartre to be exact. Home of literary giants and artistic geniuses. Surely I wouldn’t have to venture far? Parisian culture revolves around cafes and watching life go by; people lingering over their coffees, lazily having a drag from their cigarettes – the sort of place that makes you want to pause and reflect. The City of Lights exudes artistic inspiration. It is a city where writers and artists can be found in the unlikeliest of places, absorbed in their work, drawing inspiration from whatever is around them. It’s probably why I find myself spending an inordinate amount of time with my journal every time I’m there. And every time I return, I find a new place that arouses the writer in me. The following are some of my favourite places to pen my thoughts and range from cafes to libraries and even parks. A short walk from my apartment brought me to this classy café in the bustling neighbourhood of Abesses. The art deco architecture and liveried waiters hark back to another era. A table on the pavement or terrace proffers the best views of Rue Abesses. The waiters, undoubtedly used to the patronage of many a writer, seem to be geared with a sixth sense when it comes to knowing when to top up your coffee or leave you undisturbed. I struck up a conversation with the head waiter, who upon noticing me scribbling away in my journal, regaled me with stories about the many quirky novellists that had set up camp at Le Sancerre. He unceremoniously informed me, in heavily accented English, that I wasn’t drinking nearly enough coffee to be a serious writer. While I laughed and assured him I was merely small fish, a little voice in my head implored with me to order another one. He promptly placed a frothy cup of cappuccino before me and declared it was on the house. I’d just emerged from the Catacombs of Paris onto a bright and bustling street in Montparnasse. My visit to the infamous underground network of ossuaries, where the remains of over 6 million people were on put on a macabre display, had left me reeling. As I walked aimlessly trying to collect my thoughts I felt the urge to write about my experience. As if on cue, I spotted a flashing neon sign: Le Select. I noted the mirrored interiors and the 1920s styled red, leather booths that I’ve come to associate with Parisian cafes and settled into one of the terrace tables for a bit of quiet reflection. Beyond, Parisian life A gaggle of tourists interrupted my flow and I heard the name “Hemingway” thrown about. My love for his books compelled me to stop a waiter and ask him more. I was astounded to discover that Le Select was a favourite haunt of Ernest Hemingway, who lived around the corner. Both he and F. Scott Fitzgerald have been known to use the space in this legendary café to mingle and write. Armed with this knowledge, and feeling absolutely awestruck, I furiously penned my article on the Catacombs. A great place for writers who want to bask in some of the magic that had inspired some of the greatest names in English Literature. I first stumbled upon this quaint bookstore while on a leisurely stroll by the Siene over a decade ago. Spying a row of wooden carts teetering with books, I’d ducked into a side street to inspect, and as I did, I chanced upon the green and yellow façade of Shakespeare and Company. Browsing through the rustic shop, crammed floor to ceiling with books, it was love at first sight. A time before the smartphone, I was abysmally ignorant of its fame and only learnt of it relatively recently while watching a travel documentary. And why shouldn’t it be famous?! Since its inception the shop has welcomed writers and artists to work and sleep inside the shop itself, on the narrow beds and threadbare armchairs that still lie scattered amidst the dusty shelves and teetering columns of tomes. The perfect setting to get your creative juices flowing! Today, there is usually a queue to enter the bookshop, but the shop’s café next door provides an excellent alternative with views of the Notre-Dame and the lush gardens of St.-Julien-le-Pauvre. Paris’s answer to Oxford, the Sorbonne is one of Europe’s oldest universities, and is as beautiful as it is prestigious. The gorgeous edifice is matched by stunning interiors, particularly in the library, one of the few places I was lucky enough to visit with a friend studying there at the time. Joining the students and academics in the grandiose reading room, it is a great place to get some peace and quiet for a spot of writing. It must, however, be noted that the library is generally out of bounds to visitors, though certain sections may be opened to members of dedicated tour groups. While it is possible to arrange tours (French speaking only) through the university website, your best bet will be to befriend a student who can let you in. The Labrouste Reading Room at the Richelieu Library provides another majestic setting to immerse oneself in. The cavernous room, recently renovated to its original splendour, is reminiscent of a grand palace. Surrounding the rows of reading desks are three levels dedicated entirely to shelves full of books. The last time I visited, a quick and easy registration was all it took to access the main reading rooms. For warm, sunny Parisian days, I’ve learnt to reserve my writing for the many manicured parks meticulously etched into the city’s blueprint. The Luxembourg Gardens offers plenty of solitude in its many verdant nooks. However, my favourite outdoor spot, cliched as it is, is the vast green expanse of Gardens Champs de Mars at the foot of the Eiffel Tower. It’s a lovely spot to stretch out with a picnic and some relaxed writing, with the Eiffel Tower standing guard over you, a reminder of the arousing, historical city you’re in.